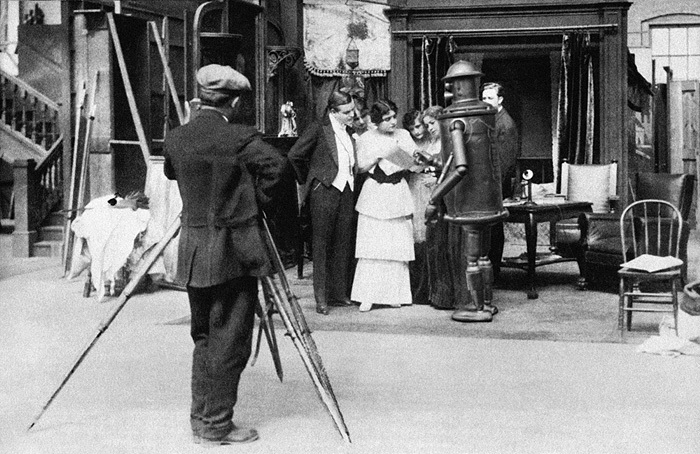 Boilerplate goes over a script with fellow actors at Essanay Studio. The famed Chicago film studio was established in 1907, long before Hollywood became the movie capital of America. Essanay produced hundreds of films, including the first Sherlock Holmes, Jesse James, and A Christmas Carol movies. Among the stars who began their careers at Essanay are Charlie Chaplin, Ben Turpin, Wallace Beery, and Gloria Swanson. Louella Parsons, a screenwriter at Essanay, went on to be a famous Hollywood gossip columnist. During this period, four out of every five films in the U.S. were made in Chicago. However, because camera and lighting technology demanded shooting in daylight on open-air sets, in 1912 Essanay moved to sunny California. It was the beginning of an exodus of film studios to the Golden State, where they enjoyed year-round shooting schedules.